When Vanessa Vargas graduated from UAB in 2013, she left with two advantages. One was a high-quality undergraduate degree in human resource management. The other was the hands-on career experience she had gained growing up in the family business, Latino News, a key media source for Alabama’s Hispanic community. 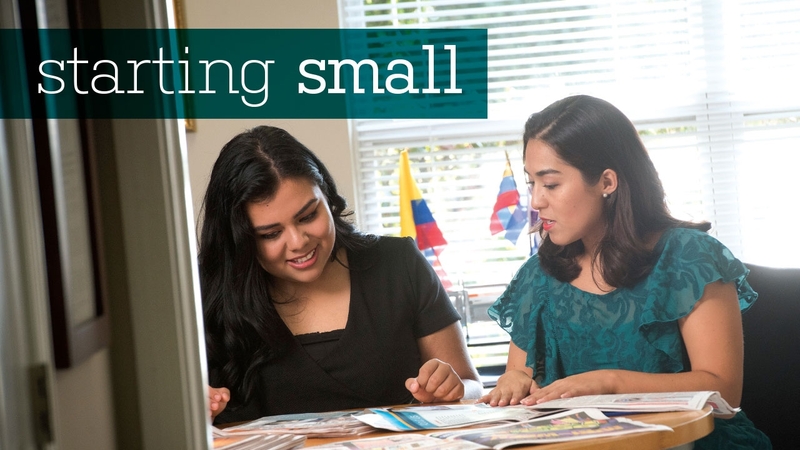 Eager to help today’s students navigate that difficult learning curve, Vargas—now manager of Latino News—opened her company’s doors to UAB’s Academic Small Business Alliance (ASBA) when it launched in 2015. The program specializes in placing UAB students in internships with small businesses in the Birmingham area. UAB has a long history of working with local small businesses to help them grow, says ASBA Manager Demetria Scott. She works in Small Business Inclusion, a unit within UAB’s Facilities division, and recalls the brainstorming session that produced the idea for ASBA. “A group of us got together, and I presented the concept of bringing small businesses and students together to collaborate as it relates to building capacity, scalability, and accountability,” she says. It’s a perfect match: While students gain valuable experience, the businesses access additional brainpower they need to grow. Dalila Gonzalez (above, at right) filmed videos for Latino News with guidance from mentor Vanessa Vargas (at left). (At top) Gonzalez and Vargas review recent issues of the company’s newspaper. For students who sign up for ASBA, however, experience provides more motivation than money. They are interested in applying what they’re studying in school, getting their feet wet in an actual business setting where they can fine-tune their areas of interest. Several students have even received job offers after graduation from the companies where they interned. For her part, Vargas says she takes her role as a mentor seriously, tailoring each internship to the interests of both the student and the business. “It’s a learning experience for both of us,” she says. For example, a couple of interns were primarily interested in accounting, so she taught them to perform those functions for Latino News, freeing her to focus on other company goals. But Gonzalez, who interned there in spring 2017, told Vargas she hadn’t made up her mind about specific career goals and wanted to learn about everything. So Vargas let her work in different areas to see which ones piqued her interest. Gonzalez did managerial work, helped with payroll, and even filmed short videos in Spanish promoting weekend events. “I think she appreciated gaining experience that could guide her wherever she leans in her professional life,” Vargas says. • Discover the opportunities for learning and experience in the Collat School of Business and the School of Engineering. • Give something and change everything for the next generation of community leaders.